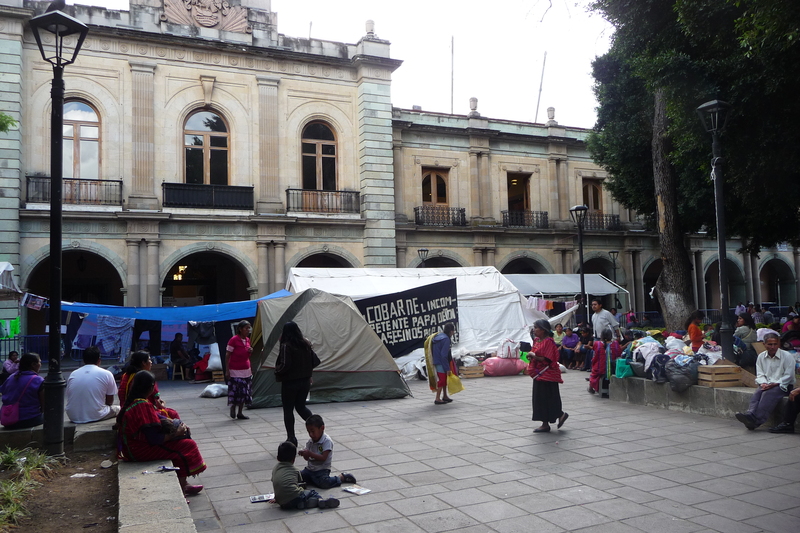 The Triqui people of San Juan Copala have reclaimed their position in front of the Government Palace in Oaxaca City after being forcibly evicted by state and municipal police just one month ago. The plantón (protest camp) was cleared, for the second time since 2011, to make way for the many tourists that descend on Oaxaca over the Christmas period. Shortly before the eviction, state governor Gabino Cué gave an interview in which he said there is no reason for the Triqui encampment to continue in the doorway to the Government Palace, asserting that the state government had taken the necessary steps to address the protesters demands. Cué maintains that authorities have complied with the precautionary measures outlined by the Inter-American Commission on Human Rights (IACHR) in 2010, in which the IACHR asked the Mexican government to guarantee the safety of the 135 people displaced from San Juan Copala by paramilitary violence. In the year proceeding IACHR’s declaration, there were 25 documented cases of people killed in San Juan Copala and 17 of injuries sustained during the conflict. State police have been stationed in front of the Government Palace since the eviction in December, barring the return of the Triqui plantón with barricades. The Triqui re-established a new encampment one block southwest of the former site, living in cramped conditions as they blocked traffic on a through-road. There, the protesters posted information around the new camp, denouncing the inaction of state governor Gabino Cué and also claiming that one woman had gone into labour prematurely following the forced eviction. The baby, named Jesús Hernández, passed away just four days after he was born. On 21 January, the Triqui plantón returned to the front of the Government Palace in the main square of Oaxaca. As state police are still barricading the covered porch of the government palace, where the Triqui formerly resided, the plantón this time sits in the open square. The camp seems to be mostly made up of women and children and there is little respite from the elements beyond tarps strung up overhead. 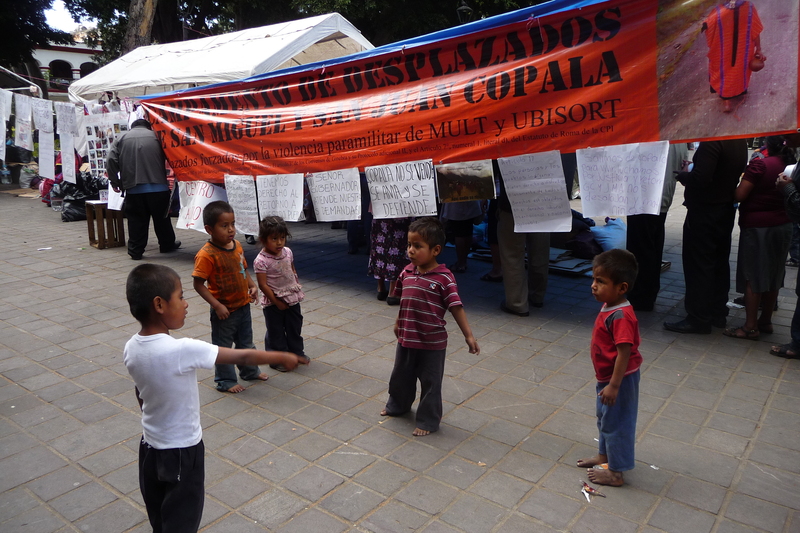 Ivette Martínez Najera, a resident at the camp, related how the paramilitary violence in the towns of San Juan Copala and San Miguel Copala had forced residents to relocate to the city of Oaxaca. 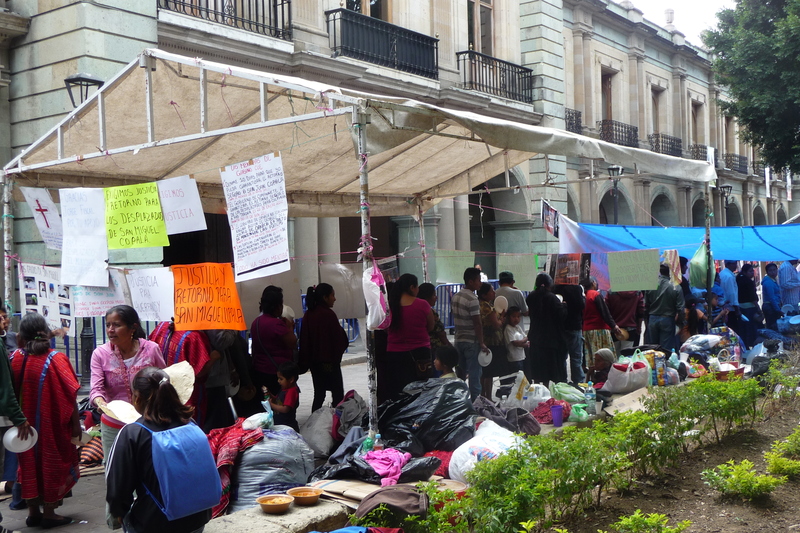 Ivette explained that one of the options the government offered was relocation to a town an hour outside of Oaxaca, which was not considered an acceptable alternative by the displaced residents of the camp. The people living at the plantón do not consider that the authorities have fulfilled their obligations and so they continue asking the state government to provide them with safe passage home. They are asking for help to put an end to the ongoing climate of fear and the violence that has marred their region, including the all-too-frequent threats, injuries and loss of life. The ongoing conflict in the Triqui territory has primarily involved two rival paramilitary groups – MULT (the Movement of Triqui Unification and Struggle) and Ubisort (the Union of Social Welfare of the Triqui Region). Contrary to what their names suggest, these groups have violently sought to control the natural resources in the area and they also have connections to PRI – the conservative political party that ruled Mexico for 71 years under a regime of corruption and repression. San Juan Copala declared its independence from the federal government in 2007. 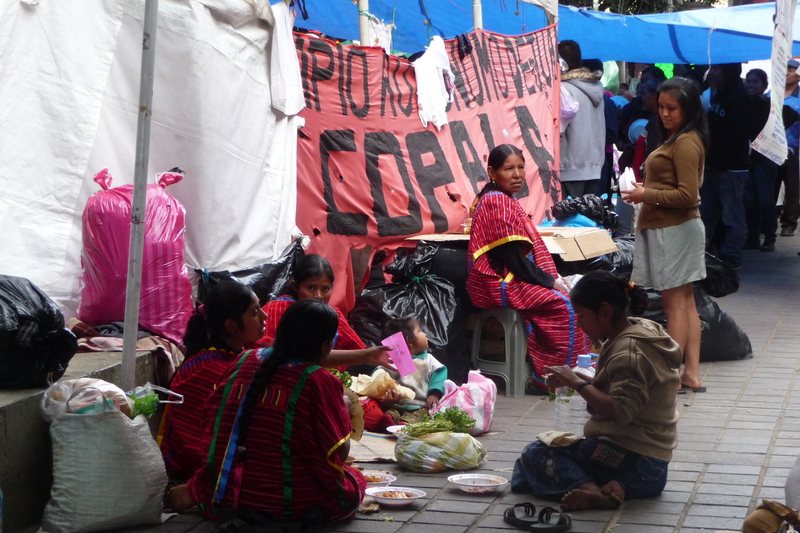 Many indigenous communities in Oaxaca have claimed their autonomy from the state under the system ofusos y costumbres (traditions and customs), opting to utilize traditional forms of self-governance and decision-making rather than participate in national politics. In reality, little is decided democratically at the local level in San Juan Copala. Ivette explained that at present MULT claims to have control of the municipal council and they have been sending out misleading photos of the council in session, with their flag prominently displayed in the municipal building. In San Juan Copala, the transition to autonomy has not had much of a chance to take root; few could argue that those in power have the interests of the people at heart. As Ivette said of her hometown, for those who have other options, there is little choice but to leave. In December, the state governor said that a development plan for the Triqui region had been drawn up in conjunction with the federal government and that it would be implemented by working with local authorities – a move that is likely to be controversial for the Triqui who do not recognize the legitimacy of the current municipal council. The governor also stated that the Triqui protest camp had been ‘infiltrated’ by a group trying to reap personal benefits from the situation, further complicating negotiation processes. In the past few years there have been many claims and counter-claims from people on different sides of the conflict, making it difficult to decipher the true course of events. While the situation is extremely complex, what we do know is that living conditions at the camp are inadequate for those stationed there for long periods of time. There are a number of small children living at the Triqui plantón and for some of them it is all they know – they chase each other and play games in the large pedestrian area that has once again become their backyard. 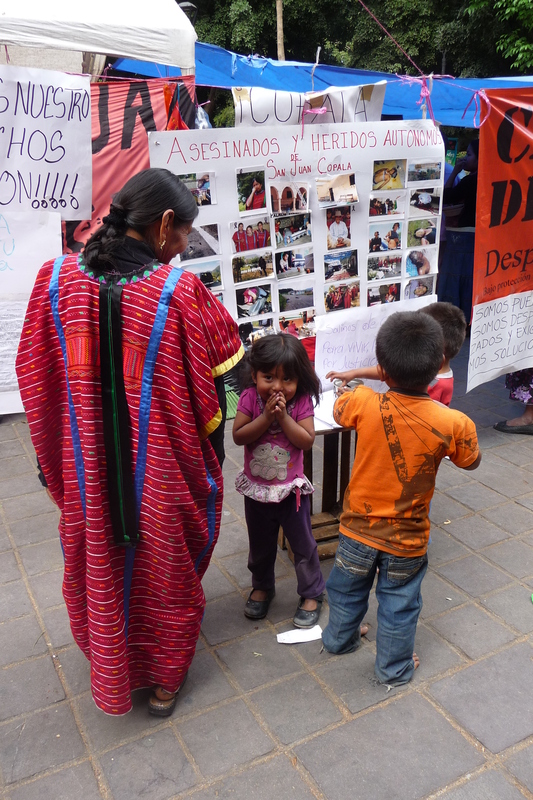 They live amongst a barrage of information that informs passersby of the desperate situation facing the Triqui, including a poster with graphic photos documenting the injuries (sometimes fatal) that people have suffered as a result of the ongoing violence in the Triqui region. The young people at the camp live with daily reminders of the bloody conflict that prevents them from returning home, a burden that lies well beyond their years.